The Farm Shop at Hawkesbury was initially opened by Andrew and Karen Morgan to supplement their farming enterprise but now the roles have been reversed, with the farm having to suit the needs of the shop. Rebecca Jordan visited in the run-up to Christmas. Six years ago Andrew and Karen Morgan would perhaps sell half a dozen eggs on a Sunday from their farm shop. Fast forward to the present day and it is a very different story at The Farm Shop at Hawkesbury, in Hawkesbury Upton, south Gloucestershire, with sleep being something of a luxury in the run-up to Christmas. “By the end of Christmas Eve, when the last of the beef and turkeys have gone, we will only be fit to collapse,” says Mr Morgan. 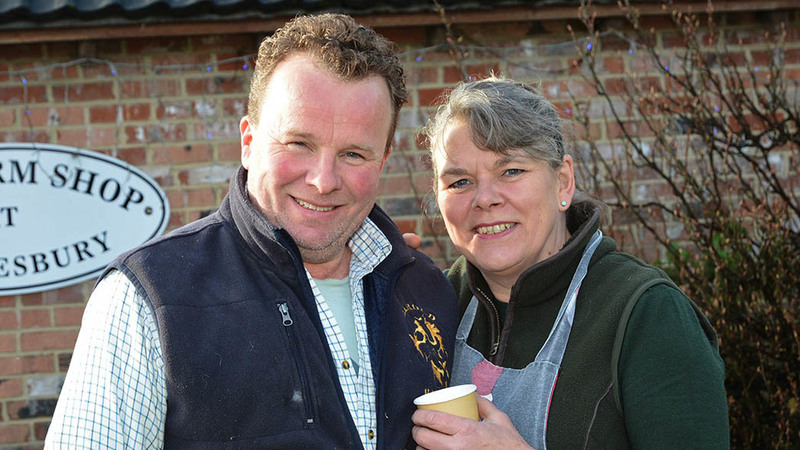 But while the farm shop side of the business has been steadily expanding, the Morgans have made sure they have not lost sight of the core farming business. Stock numbers have been built up and now meat from the farm’s own cattle, sheep and pigs is used in the farm shop, which is currently open at weekends and Friday afternoons. Mr Morgan’s parents farmed in the village but circumstances forced him to find another trade; he was a full-time bricklayer for 20 years. He built the house at France Lane Farm in 1994 for his parents and, following his father’s death in 2009, Mr and Mrs Morgan took on the farm’s 32 hectares (80 acres). They started with a sow, 12 ewes, six lambs, an ancient tractor and telehandler. They also took 16ha (40 acres) of sheep keep in the Kilcot Valley. Cows calves all-year-round to ensure consistent supply of one beast to the shop per month. In 2010 the Morgans bought four Jersey cross heifers going cheap at market. A neighbour lent them a native bull and three calved down. Soon after, they bought nine pedigree Aberdeen-Angus bulling heifers from a retiring farmer at Willesley and then rented his 16ha (40 acres). There would be no return from any heifer calves born for at least five years. By this time the Texel cross flock had increased to 40 ewes, with lambs going to the local abattoir, Broomhalls at Eastington, where they were butchered for local trade. At this stage Mr Morgan was still working part-time, making and selling cider presses and pig arcs to supplement income, and Mrs Morgan was a full-time bookkeeper. 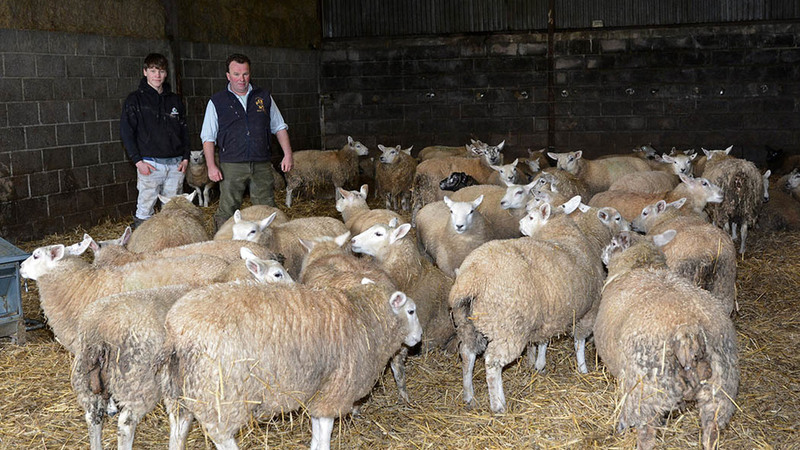 “If we sold all our livestock through market it was obvious we were not going to make money,” says Mr Morgan. “We had to cut out the middleman so, in 2010, we converted the tack room and I built a food preparation room which also doubled as a very basic and small farm shop. Friesian cross heifers are bought at six months of age and sold after calving. Three years later they converted the adjoining two stables into the shop, extending their trading area four-fold. Mr Morgan’s skills kept costs to a minimum and they cobbled together enough to invest in the required fixtures and fittings. To date, there are 80-head of cattle. 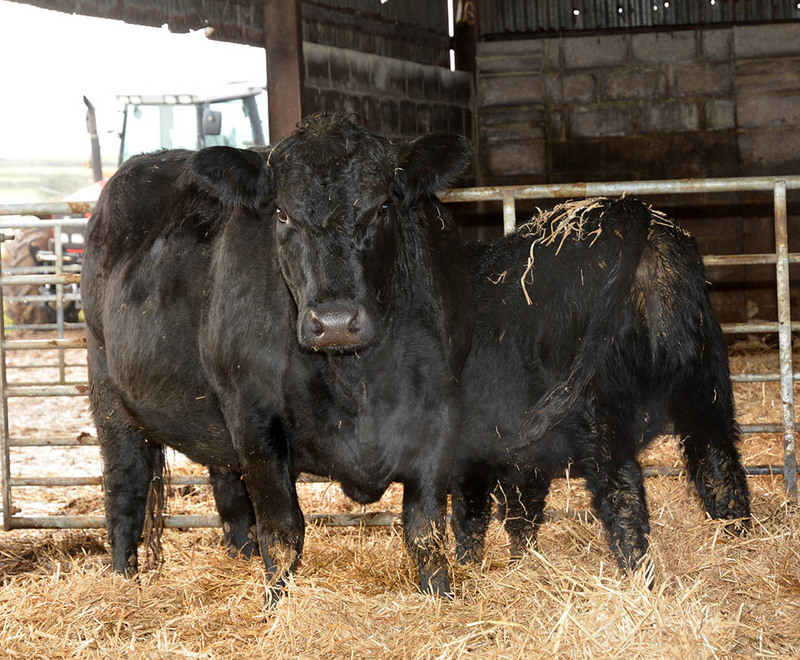 The best of the pedigree Aberdeen-Angus heifers are kept for replacements, the rest go through the shop or are sold at market as stores or finished. Best bull calves are sold to breeders; the rest go the same route as the heifers. Mr Morgan’s latest successful venture is buying-in six-month-old Friesian cross heifers from dispersal sales. These are sold soon after calving down to an Aberdeen-Angus, with the calves reared on and sold at market. Cows calve from March to October to ensure a consistent supply of beef. They are block grazed during summer, with calves weaned at eight months old and killed at 24 months old. 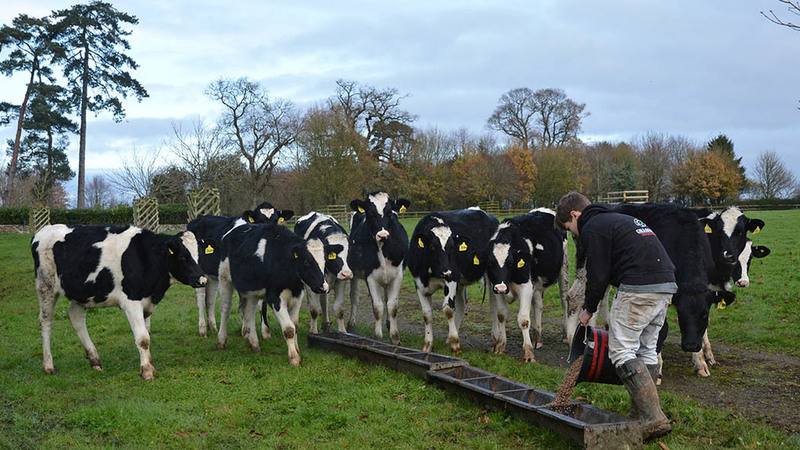 “They get 2kg/day of concentrate and round bale silage. I do not push them because I really believe it makes a huge difference to the quality of the beef,” explains Mr Morgan. “There are very few places you can buy genuine Aberdeen-Angus beef, so we have people travel quite a way to buy ours. Each month a beef animal goes through the shop. That is increasing. For Christmas this year we killed two in November which will hang for 28 days. It is very difficult to know what the demand is going to be so you have to think on your feet every day. George Baxendine (left) provides help with the Morgans' livestock. The 200 Texel cross ewes lamb at home from mid-March to April. They lamb at 170 per cent and are weaned at a similar percentage 12 to 16 weeks later. Creep is only offered when grass is in short supply. Otherwise they rotate around the Kilcot Valley over 16ha (40 acres). Lambs for the shop are finished at 20-22kg deadweight but most are sold live at Cirencester market when they reach 40kg. “Year-round, one a week goes through the shop. Christmas makes little difference to demand. However, we do get many repeat customers as I can produce any cut required. A real selling point is customers – especially older people – get what they want, not what is on offer,” says Mr Morgan. Offspring from the six pedigree Welsh sows – which run with a hybrid boar – all go through the shop. They farrow year-round to meet the weekly demand of a side of bacon. Mr Morgan admits he doubles his money on pigs, compared to selling at market; there are many different ways of adding value to pork. Two water wheel-driven hog roasts are in demand during summer. “It is very hard work but a good source of income. We can put on pigs weighing anything from 30kg to 90kg deadweight and cater for up to 300 people,” explains Mrs Morgan. As well as this the Morgans make all their own sausages, cure bacon, cook home-made pies, pate and faggots, and there is a strong ethic to source produce such as vegetables, bread, cakes and dairy locally. Poultry – including Christmas turkey orders – are bought-in from Castlemead based in Radstock near Bath. Christmas trees are grown locally. This is the third year they have been for sale outside the shop and are very popular. The added attraction of both these products is they draw in new customers. The Morgans say they could not manage without neighbours, family and friends who help with everything from harvest, spreading artificial fertiliser, spraying, website design and TB testing. “However, we would have been really stuck without 15-year-old George Baxendine. He wants to farm when he is older. It has been so satisfying watching him realise what he loves to do. 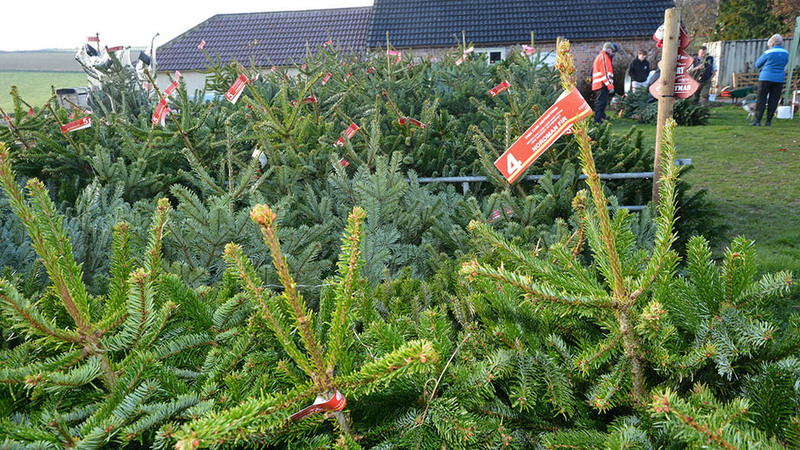 Locally grown Christmas trees help to bring in new customers in the run up to Christmas. “We are gradually expanding and progressing. The fact we have not gone at it full tilt is the main reason the business works. The percentage of income reinvested is colossal. If that was not the case it would be fair to say we are sitting in a pretty good position,” says Mr Morgan. “My plan is to buy more land, increase and improve the farming side of the business which in turn will benefit the shop. 200-head Texel cross ewes put to a Texel ram to lamb March and April.